Located in the beautiful village of Oia, the Caldera Massage Studio is a spa that helps to relax and rejuvenate the body, mind and soul with the help of traditional therapies drawn from several treatment philosophies around the world. The spa opened in 2006 as a perfect answer to today’s stressful lifestyle and provides a variety of face, body and beauty therapies. Its unique ambience created by the zen-inspired environment that has been carved out of Oia’s Caldera makes the spa a breathtakingly-beautiful place with its open-air treatment set on a terrace against a magnificent backdrop of the sea and the volcano. The other amenities at the spa include: an enormous Roman bathtub, dry sauna, cave style treatment rooms, showers (outdoor and indoor) and a Jacuzzi facing the caldera. The spa offers a range of face, body and beauty treatments, which elevates the body and mind to a state of total relaxation and harmony. The ancient treatment of acupuncture is employed to release the pressure points on the face and to cleanse, tighten and moisturize the facial tissues. This is followed by aromatherapy using special products to suit the specific skin type, which tends to restore the skin’s natural beauty and tone. The spa also offers an astounding range of body treatments. The caldera massage, a popular therapy at the spa, is a full body massage based on a combination of Californian, Swedish and ayurvedic therapies. 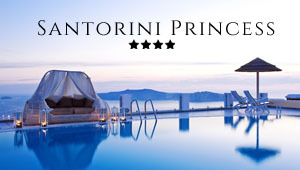 The Santorini massage with volcanic hot stones uses the concept of thermotherapy. The yin and Yang massage draws from ancient Chinese therapy based on the “Tui Na” massage technique. And then, there is the Bulgarian scrub and glow massage using essential oils, honey and yoghurt to exfoliate the skin, improve blood circulation and help regenerate the skin. Guests can step from the spa into their private suite that is the last word on luxury and comfort, complete with an antique canopy bed from where you can have splendid views of the caldera, while munching on a "Lazy Breakfast" that is packed with good taste and health.